It takes 702 pages to get there, but that does seem to be the point. Not that it’s not fun along the way, but subtle, this book ain’t. In the town of Dooling, somewhere in the Appalachias, the women’s prison is the main local employer. Between the town and the prison, we meet a heap of characters — so many characters, in fact, that the book opens with a four-page listing of characters and their descriptions — which, believe me, is necessary if you want to make it through this massive book with any shred of sanity remaining intact. The vast cast of characters includes the sheriff and her husband (the prison psychiatrist), sheriff’s deputies, prison guards, prisoners, high school bullies, and all sorts of other townsfolk. The onset of the Aurora plague (named for Sleeping Beauty in the fairy tales) is pretty fascinating stuff. Worldwide, women are falling asleep, and once they do, they become encased in a filmy cocoon. They sleep, seemingly permanently, in these cocoons unless someone foolish (usually a man) decides to try to get them out, in which case they awaken with homicidal intent, murder whoever disturbed them, and then fall back to sleep as the cocoon reestablishes itself around the sleepers. Major freak-outs ensue. What’s causing this, and what can be done? While some women give in to the inevitable, others become determined not to sleep at all, turning to all sorts of legal and illegal stimulants to stay awake, from super-powered coffee to crystal meth. As the days wear on, regular life all but disappears, and the men who are left behind turn to violence and chaos. Small town dynamics suddenly take on huge significance. Sides are drawn up, and to a certain extent, the law of the jungle takes over. Those who are strong, survive. The physically or mentally weaker of the men are pushed aside, and as power is extended to those who should never, ever have it, we can feel the threat-level creep up into the danger zone. I can’t say I was ever bored while reading this book, but really, it’s much too big for its own good. “Overstuffed” is the word that came to mind, especially as I neared the halfway point and realized that the amount left would be equivalent to reading yet another full novel. I don’t think we need quite so many backstories for quite so many characters. Not all of it is important, and a more honed narrative might have helped the narrative feel sharper and more focused. I’m not sure that the end makes a whole lot of sense, but I often feel that way with Stephen King books (and yes, I’m a big fan). There are many unanswered questions about the why and how of the Aurora plague. Why do we get the resolution that we get? Because we do. Why is this the answer to Aurora? Because it is. Still, Sleeping Beauties is filled with small and big moments of adrenaline-pumping suspense, with everyday scenes carrying extraordinary hints of menace and violence. As is typical of King novels, the huge number of characters comes together to give us the flavor of the community — although I’ll be honest and admit that I stopped bothering to distinguish between handfuls of the more minor characters as the story progressed. 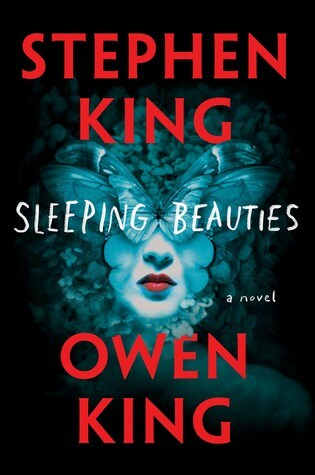 Overall, I enjoyed Sleeping Beauties, but don’t think it’s Stephen King’s best work by a long shot. The message, as I mentioned at the top of the review, is really pretty basic and obvious, and at times I felt like I was being beaten over the head by the senseless need for violence exhibited by men in crisis, especially as contrasted by the peace and cooperation shown on the women’s side of the equation. For a look at how Stephen King and Owen King worked together on Sleeping Beauties, check out this piece in a recent Entertainment Weekly. I feel the same way you do about unnecessary back stories on minor characters-what’s the point, other than to fill your publishers page requirement? It’s more of an irritant to readers, so I’m never quite sure why authors include it. Ah, I loved The Shining! I re-read it a couple of years ago right before the sequel came out. I need to reread The Stand one of these days… but it’s yet another huge Stephen King book, so it may be a while before I feel up to tackling it. Love Mr Kin’s workg but I agree that some of the books are a little longer than necessary for a great read! It really depends — I loved 11/22/63 and Under the Dome so much, and even though they were huge, I never felt like there was a wasted word.